Welcome to yet another grim chapter in the lives of the three Baudelaire orphans. This time we‘ll be talking about episodes 5 and 6, which make up the third story known as The Wide Window. Spoiler warning for the show and somewhat for the books as well. Trigger warning for child abuse, violence, suicide, murder/death, as well as leeches, allergic reactions, clowns, and mysterious taxi drivers. The Baudelaires arrive at Damocles Dock, on the edge of the large, eye-shaped Lake Lachrymose. As a gift, Mr. Poe gives the children peppermints, which they are allergic to. (It’s worth noting that while these peppermints come in quite handy for the children in the book, Violet immediately throws them away at the start of this episode.) They are there to stay with their aunt, Josephine Anwhistle. Mr. Poe can’t tell the children much about her, other than that she is a dowager. For some reason, Josephine has refused to meet them at the dock, and they are told to take a taxi to her house. The taxi driver is an eccentric man in Hawaiian shirt, who has an obsession with Herman Melville and vegetarian chili. He tells the children that Hurricane Herman is coming. The Baudelaires have already been told by Jacquelyn that their aunt is a fierce and formidable woman who will tell them all the secrets of the mysterious organization they keep finding allusions to. When the children arrive at their aunt’s house, they find it is an old shack hanging off the edge of a cliff with a 300-foot drop below. “Please go away” is written on the door. The doorbell doesn’t work, but before Klaus can knock, the door is quickly opened by a timid woman who is afraid knocking will give the boy splinters. This timid woman, it turns out, is their “fierce and formidable” Aunt Josephine. Instead of the brave woman they were expecting, Josephine seems to be afraid of everything. Besides the doorbell being disconnected, her phone is placed under glass, she screams at the sight of a mirror, the house is freezing as she refuses to use the radiator, and due to being afraid of stoves, she will only serve the children cold soup. Josephine Anwhistle used to be a brave woman. In the room with the wide window overlooking the lake, there is a statue of her brandishing a sword. But everything changed when her husband Ike died. Josephine tells the children about her husband,and about how the two of them used to be friends with their parents and developed secret codes together. But one day Ike went swimming and the carnivorous Lachrymose leeches – who can smell food on a person if they swim without having waited an hour after eating – attacked him. Below Ike’s portrait is a safe. The children think Josephine is about to open the safe and teach them secrets, but instead, she covers up the safe and starts teaching them about grammar, which she is obsessed with. They try to persuade her to tell them the things they need to know, but Josephine refuses to talk about anything about her life before Ike’s death. Klaus suggests that perhaps she would be more healthy (and more willing to tell them the information they need) if she moved away from the lake. Josephine says this is impossible as she’s terrified of real estate agents (which the children, of course, think is absurd). Olaf arrives at Lake Lachrymose and confronts Larry, a waiter at the Anxious Clown restaurant and member of the secret organization. They mention an “unpleasantness with Mr. Snicket,” and Olaf reveals he thinks the Baudelaires are with Mr. Snicket, since he heard they were sent to the organization’s fiercest and most formidable member. It’s also revealed that they believe Mr. Snicket is dead. Larry, who is not on Olaf’s side, accidentally lets slip that the Baudelaires are currently living with Josephine Anwhistle – that they were sent to her due to reports of their incredible gifts. Olaf has his henchpeople tie Larry up. Aunt Josephine gives poorly chosen gifts to the children (a doll to Violet, playing cards to Klaus, and a rattle to Sunny). She plans on having everyone stay in the house at all times. The Baudelaires remind her that a hurricane is coming and that they’ll need supplies. After she leaves to buy the supplies, the children use her absence to have a secret, warm, candlelit meal. They trade gifts and talk, letting out their frustrations about Josephine and how she makes their life more difficult despite being a good person. Klaus suggests they look inside the safe. After figuring out the password, the children find some very interesting contents – music notes, pictures of Josephine on adventures during her daring days, and a book on secret organizations. Unfortunately, the children don’t have time to read the book before Josephine comes back home. Josephine announces she has met a man she has feelings for. She introduces him as Captain Julio Sham, but the children can clearly see he’s Count Olaf. He has a wooden leg in place of where his tattooed ankle should be. In a flashback (which also includes a cameo by the books’ author, Daniel Handler), we see Olaf got Josephine’s sympathy by telling her he lost his leg to the Lachrymose leeches. They set up a date to discuss his “tragic life,” and she tells the children she is just stopping by to get her cardigan. She won’t listen to the children’s protests, and Olaf decides to shut them up by causing a distraction. The candles the Baudelaires used earlier are still lit, and Olaf pretends to “save” Aunt Josephine from the dangers they pose. Josephine chides the Baudelaires for their irresponsibility, tells them to clean the dishes and go straight to bed, and then leaves for her date. The Baudelaires attempt to leave the house to rescue their aunt, but Olaf’s henchpeople are outside guarding it. The children try to form a plan. While working in their room, they suddenly hear a shattering noise. Olaf and Josephine have come back home, and now there’s an Aunt Josephine-shaped hole in the wide window. She has apparently jumped to her death. The children find a suicide note that states they are to be put in the care of Captain Sham. Meanwhile, with some help from their new Peruvian friends, the mysterious couple uncover an old plane. Looking over the note, Klaus finds grammar and spelling errors – something the grammar-obsessed Josephine would never write. The children believe Olaf forged the note. But when Mr. Poe arrives, he compares it to a grocery list Josephine wrote, and the handwriting matches. Of course, Mr. Poe doesn’t believe the children when they tell him Captain Sham is Count Olaf and plans to put them in his care just as the note specifies. Although they want to stay at the house to investigate Josephine’s death, the children are forced to go to lunch with Poe and Olaf at the Anxious Clown restaurant, where “Captain Sham” is to sign the papers and finalize the arrangements. At the restaurant, Larry struggles to help the children despite being threatened by Olaf’s henchmen in the kitchen. Olaf makes sure to mention Josephine's death when Larry is in earshot to discourage him. The waiter acts extremely suspicious while serving the children in order to get their attention, dropping them hints that he’s on their side. This plan succeeds well enough for him to learn about the children’s peppermint allergy, and he sneaks them some peppermints so they can trigger the reaction. When Poe sees how sick they are, he allows them to head home. Meanwhile, the mysterious couple attempt to call Larry from the plane’s phone, but the hook-handed henchman interferes in the call before he can give them any valuable information. They are driven once more by the strange taxi driver (who reveals his name is Ishmael) and go inside to take another look at the suicide note. The errors spell out a secret code that points the children to Curdled Cave. The children wonder if perhaps Josephine faked her own death and is hiding out at the cave. They find it on a map in the library and realize the Fickle Ferry will take them there if they make it in time. Just then, Hurricane Herman hits the house, blowing the library’s books, papers, and photographs out the window. Klaus only manages to save one picture – a picture of their parents and other members of the secret organization standing in a small town with smokestacks labeled “Lucky Smells” looming in distance. The children get out of the house just before it topples over the cliff. The children head to the Fickle Ferry, only to find it closed due to bad weather. Stealing some life-jackets and a boat, the children brave the hurricane and sail to Curdled Cave themselves. There they find Josephine, who relates her side of the story. Olaf forced her to write the suicide note. Since she knew he intended to kill her, she pushed the statue of herself through the window and climbed down the cliff to a boat she keeps below. Now that the children have come to her in the cave, she hopes all of them can stay there forever because she is too frightened to leave. However, Klaus convinces her to leave by telling her the cave is for sale and real estate agents will come and visit. Upon entering Lachrymose leech territory, the Baudelaires are horrified to discover Josephine ate a banana just before they arrived. The leeches begin attacking the boat, biting holes in it so it begins to sink. There isn’t enough wind to make it to shore in time. So the Baudelaires try to make a signal using moonlight to set a fire. This unlikely plan works, but only because they get help from an additional lens: the mysterious couple, who may or may not be their parents, are watching them via spyglass from the plane. They are too far away to see the children’s faces, and they ultimately decide not to go down to help because they see a large boat already coming to the kids’ rescue. They also deal with a new problem when their plane runs out of gas. Josephine and the Baudelaires get on board the big boat just as theirs sinks, only to find Count Olaf is captaining it. The children foolishly tell Olaf that Josephine will tell Poe the truth and send him to jail. And when Olaf accidentally reveals he gave Ike the food that got him killed, Josephine gets angry and agrees with the children that she will tell Poe the truth. Her threats sound impressive at first, but when she ends her speech by correcting Olaf’s grammar, she annoys him and he pushes her overboard. The leeches swarm around her. Olaf sails the Baudelaires back to shore. And with Josephine dead, the children have no way to prove Captain Sham is really Olaf or that they shouldn’t be in his care. Mr. Poe is waiting for them at the dock. And though, as always, he refuses to listen to the children, Sunny asserts herself and bites off Captain Sham’s wooden leg, revealing the tattoo. Poe realizes Sham is really Olaf, and the two of them argue until, as always, Olaf manages to escape as soon as Poe is distracted. Meanwhile, the Baudelaires make an escape of their own. In the distance, they spot the Lucky Smells smokestacks that are in the photograph of their parents. And right by the dock is a truck with the Lucky Smells Lumbermill logo on it. While Poe argues with Olaf, the children sneak onto the back of the truck. The episode ends with the lumber mill employee unknowingly driving them toward the place their parents once stood. Overall, while still entertaining, I’d say the two episodes that make up "The Wide Window" are my least favorite episodes in Netflix’s adaptation of ASOUE. I actually prefer the film’s adaptation of this book. The show’s version seemed much slower and just had less emotional impact. Even Captain Sham seemed less interesting than Olaf’s other disguises in the series. And I was surprised Neil Patrick Harris used the same Sean Connery-esque voice Jim Carrey used in his performance of the same character. I had hoped he would do more to make the role his own. Aunt Josephine is the final character in this series that I thought wasn’t cast correctly. I’ve heard good things about Alfre Woodard in other shows, so it’s probably not the actress’s fault. She is just not the character from the books for multiple reasons. For one, am I the only one who thinks she is far too young? The Josephine from the books was a timid old woman. For another thing, I just don’t buy her fear. When she screams at things, it feels very staged. And finally, a lot of changes were made to the character. They made her far more capable and noble on the show than she was in the book. On the show, she stood up to Olaf and was on the children’s side. In the books, she literally tries to sacrifice the children to save herself. In the end, I don’t think these changes worked for the better. By far, my favorite thing about this episode was Larry the waiter. 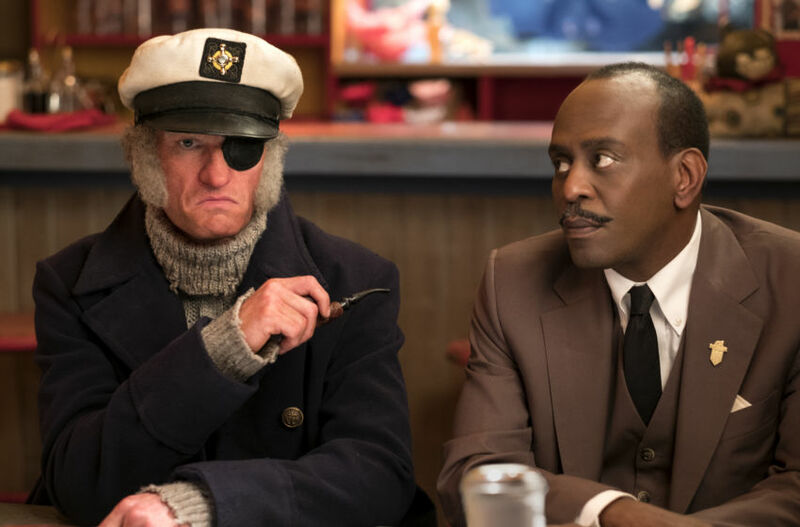 Ever since I read the books for the first time, I had hoped that an ASOUE adaptation would somehow make use of the awkward, code-spewing clown waiter. The film disappointed me in this respect. But the Netflix show gave me all of that and then some. They made him quite an important figure to the plot. And they couldn’t have gotten a better actor to play him. He gives the character all the nobility, anxiety, and well-meant awkwardness the character is meant to have. I mean… look at him. I literally screamed when the taxi driver said his name was Ishmael and had to take a break before continuing the episode. Those of you who have read all the books will know what I’m talking about. For the rest of you… just… remember this man. Remember Ishmael. That’s all I have to say. But it was brilliant. Whenever I read The Wide Window, I always thought the taxi driver seemed odd. Now I know why. • It surprised me that the characters once considered Lemony Snicket the fiercest and most formidable member of the organization, considering he’s known as a coward in the books. • In the episode, Josephine mentions that Olaf used to burn ants with a magnifying glass for fun as a child. In the books, it was a female cousin of the Baudelaires that did this. • I love when authors make cameos in adaptations of their works, so seeing Daniel Handler in the episode was amazing. That’s all for this episode. Come back next week when we’ll be talking about The Miserable Mill – the finale for Season One of A Series of Unfortunate Events!